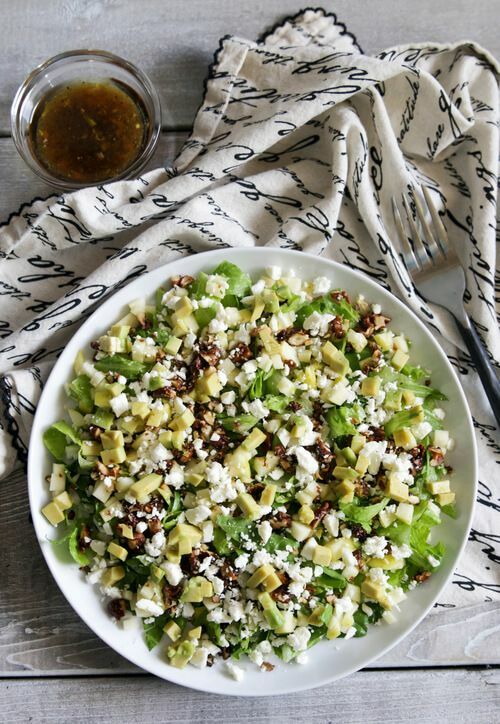 It often seems like the healthiest foods are the simplest ones—like this crunchy walnut, avocado and apple salad. It’s a simple, fantastic and filling combination of some of my favorite ingredients. Nuts are super healthy for you (unless you have allergies), and walnuts, often called “brain food,” are among some of the healthiest. A little known fact? Walnuts are also great for your hair! They contain biotin (vitamin B7), which strengthens hair, reduces hair loss, and improves hair growth. So if you notice hair loss or breakage, add some walnuts into your meals or snack. Whisk dressing ingredient together. Gently toss with salad.